Every teacher needs good quality resources they can use to cover course material effectively. With so many online lesson planning options out there, it can be hard to know which ones to use. The following sites provide easy-to-find lesson plans for teachers that are entertaining, engaging and informative, so teachers can save time planning and spend more time individualizing lessons for their students! Study.com offers hundreds of free lesson plans, and each one includes objectives, standards taught, materials, instructions, and supplementary materials. Activities range from discussion questions to group projects to classroom games and more. 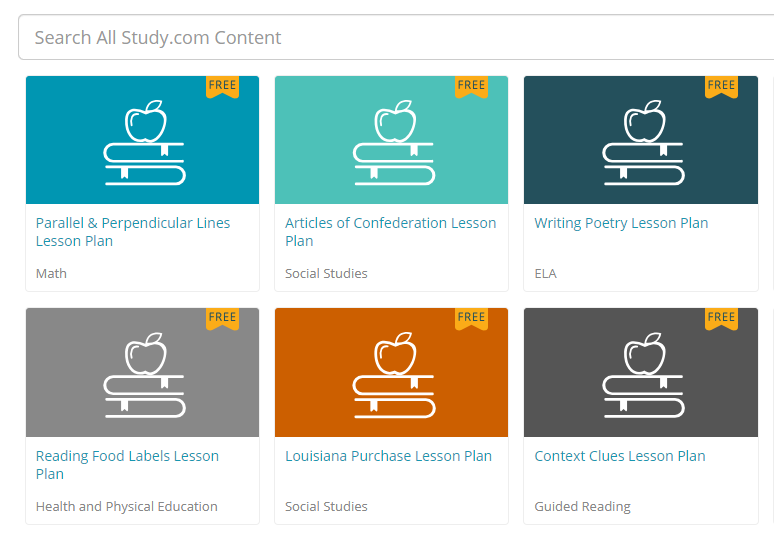 Study.com’s lesson plans cover all mainstream subjects such as Social Studies, Math, English, Science, and Art; they also offer harder-to-find subjects like ESL oriented lesson plans, health, and music. Lesson plan templates are available for popular formats like 5E, Madeline Hunter, and Guided Discovery. With all these resources, there’s no need for teachers to spend time and energy creating their own lesson plans. TeacherVision offers lesson plans on a variety of K-12 topics, sorted by subject, including Health and Safety, Art, ELA, Math, Reading, Science and Social Studies. Plans include activities, games, puzzles, graphic organizers and more. The bulk of TeacherVision’s lesson plans are for 3rd-8th grade, making it most suited for upper elementary and middle school teachers. Perfect for elementary school teachers, Clarendon Learning offers hundreds of lesson plans for 1st-6th grade. The lesson plans are organized by both subject and grade level, and they include worksheets, answer keys, and a list of sites teachers can use to expand lessons. Subjects offered include Language Arts, Math, Reading, Science and Social Studies. Teachers can sort and filter by desired activity type to find what they need. Jessica Bayliss has worked with students and developed ed tech materials for over 15 years. She has taught in elementary schools and tutored students of all ages and has seen first-hand the lack of access to a quality education that many students face. As Vice President of Content for Study.com, Jessica and her team of instructors and subject matter experts help simplify life for teachers by creating lesson plans and other teaching resources so that they can focus on impacting students.